Noticing how easy it is to see the daily dramas/events/interactions/comings-and-goings of life in isolation–separate from the whole. Noticing how easy it is to fixate on one THING and that THING becomes EVERY thing–the ONLY thing. For a while. yet knowing–somewhere in that deepest place–that without each scrap–as lovely or as lonely as it might appear– the whole could not exist. So much truth in what you’ve written! I love the piece! Reindeer on Skis–with grateful heart! and peroxide removed the blood from the needle prick quite nicely! Still, i’m sure CSI could find traces. 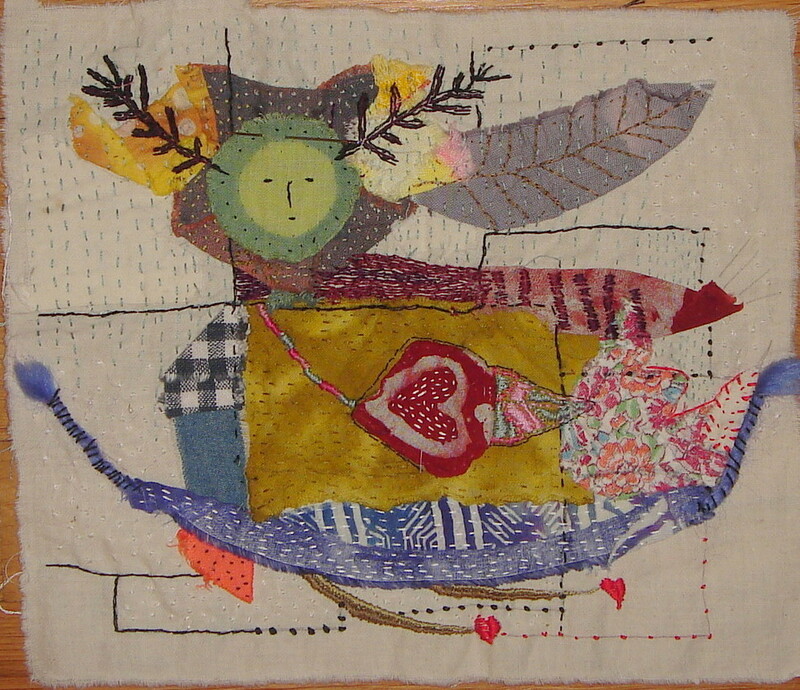 Curious to know how long it takes to stitch one of your lovely works…? you know, i think on the next piece i’ll try to track the time. it takes hours though. i’m going to guess maybe 20 hours on this piece–that’s stitching, looking, changing, stitching, looking–you know how that goes. Patricia – she is enchanting – lyrical. I want to dance with her! Truly beautiful…..
well, she’s not the greatest of all dancers–but she loves to ski! I’m always so amazed that just one little spot of thread can create so much expression. thanks for visiting! clearly has something of It’s own to say…i really like watching this…. thank you, Grace–and thank you for encouraging me to blog. it’s more time consuming than I expected, but it’s keeping me “honest” if you know what I mean. When the last photo revealed the whole…I gasped and exclaimed in my head, “Delightful!” I love the the colorful, so all inclusive of many symbols, gentle dance and mappiness of this one! this one…well she embodies so much of what was happening when she came about. it makes me happy that she delights you. Patricia, I just came across your blog last night, probably thru Grace’s. Your work is beautiful; thank you for putting time into sharing and inspiring. I’m a weaver and love slow cloth, stitched, woven or w h a t e v e r, as long as it is personal work. thanks for taking the time to comment! weavers are wonders–do you have a web site?